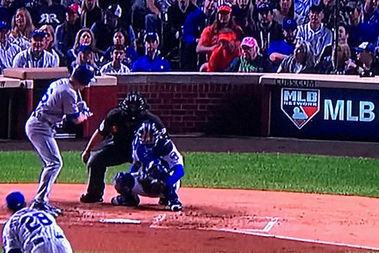 Jim Anixter is the "Pink Hat Guy" who sits behind home plate at Wrigley Field during Cubs home games. LAKEVIEW — Aldermen can no longer take advantage of the Chicago Cubs' offer to buy playoff tickets at face value, city ethics officials ruled Friday. The offer constitutes a "prohibited gift" under the city's ethics rules because the tickets are available to the public at a much higher price, according to the revised policy issued Friday by WIlliam Conlon, chairman of the Chicago Board of Ethics. Originally, Chicago Board of Ethics Executive Director Steve Berlin ruled that Mayor Rahm Emanuel and any of the 50 aldermen who take advantage of the Cubs' offer to buy playoff tickets at face value could go in their official capacity. That meant the aldermen would have to use the tickets themselves and be acknowledged by the team by having their names announced or displayed on the digital billboard in center field. The new policy would only allow aldermen to buy the tickets at face value if they performed a "ceremonial duty" such as throwing out the first pitch, marching onto the field with other officials or making a speech. The offer to buy tickets at face value could be accepted by Emanuel and Ald. Tom Tunney, whose 44th Ward includes Wrigley Field, if they attend as the "representative of the city itself" and "the representative of the citizens and businesses in the vicinity" of the Friendly Confines. Julian Green, a spokesman for the Cubs, said Thursday it was up to the city to set its own rules. "The only tickets we're focused on are those for the greatest fans in sport who will pack Wrigley Field this weekend," Green said. The new policy will not be in place for Game 6 of the National League Championship Series Saturday or at a possible Game 7 Sunday. The new policy will be in place for any World Series games. Aldermen who accepted the tickets and attended the National League Division Series and the first two games of the NLCS won't be punished, according to the new policy, which is expected to be finalized Nov. 5. The city bans public officials from accepting gifts worth more than $50. Since the tickets to the National League Championship Series are selling for thousands of dollars, accepting the tickets at face value would violate that provision of this city's ethics code. Violations could trigger fines between $1,000 and $5,000.